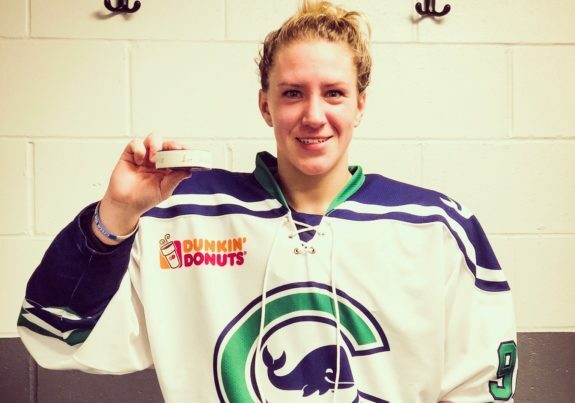 The Connecticut Whale have seemingly set the standard for European influx into women’s professional hockey in North America. The Whale presently have players from Russia, Sweden, Finland, and the Czech Republic on their 2018-19 NWHL roster. They are the first NWHL team in league history to have either a Swede or a Finn on their roster. During the NWHL’s inaugural season of 2015-16, the Whale and the Metropolitan (formerly New York) Riveters were the first squads to have Russians. In fact, the Whale have the NWHL record as the team with the most Russians in a team’s history with a total of three (though goaltender Mariya Sorokina has yet to suit up this season, she is still technically under contract). 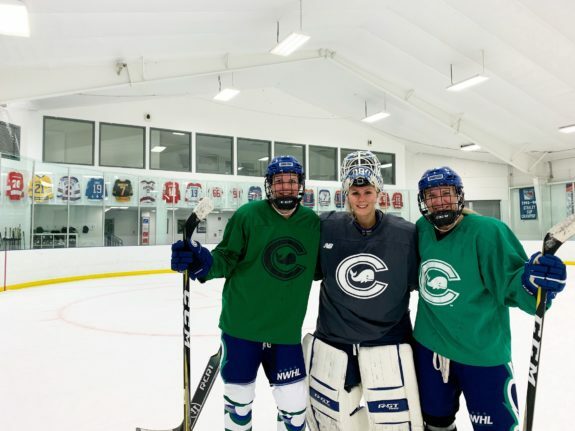 Where the Whale have made the biggest splash as far as Europeans go is being one of two teams this season to skate the first Czech-born players in NWHL history. Connecticut’s Kateřina Mrázová and the Boston Pride’s Denisa Křížová are pioneers for their fellow countrywomen as far as the league is concerned. While each has suited up this season for their respective teams, Mrázová will always be in the NWHL record books as the first Czech to play a regular season game, the first to score a goal, to pick up an assist, and to record a point. The Connecticut Whale’s Kateřina Mrázová posing with the puck from her first NWHL goal. She will forever remain in the hockey history books as the first Czech to record a goal, assist and point in NWHL history (Photo provided courtesy of Kateřina Mrázová). She has also quickly established herself as one of Connecticut’s most skillful players and one who is a necessary component for pulling them out of the 0-3 doldrums that they currently find themselves in. Through their three games thus far, the Whale have scored only two goals. Doing the simple math, the team has not been able to record a goal yet without Mrázová’s aid. THW caught up with the talented Czech forward to see what led her to signing with the Whale and what her goals are for the season. Furthermore, we chatted with Mrázová regarding her role in paving the way for more Czech players to make the jump to the NWHL. It would seem that with the early steps that she is making, Mrázová may be unintentionally persuading other female Czech hockey players to follow suit. When the NWHL came about, Mrázová knew that it was a league she wanted to play in. The fact that she was able to sign with the Whale has fit perfectly with what she wants to achieve in her own career. BREAKING: The @CTWhale_NWHL have signed Czech Republic National Team and UMD Forward Katerina Mrázová. It is not as if the 26-year-old Mrázová is completely unfamiliar with North American hockey. Quite the contrary. Prior to embarking on a collegiate career at the University of Minnesota-Duluth, she played a full season with the Boston (now Worcester) Blades of the CWHL. Playing in 21 regular season games plus four more in the playoffs, Mrázová helped the Blades win the 2013 Clarkson Cup title. Some of her teammates on that squad include well-established NWHL names of the past and present like Hilary Knight, Gigi Marvin, Meghan Duggan, Anya Battaglino and more. Following her lone season in the CWHL, Mrázová began her NCAA career with the UMD Bulldogs. Her time in college stretched from the 2013-14 season through this past year’s 2017-18 campaign. Mrázová totaled 25 goals and 50 assists for 75 points in 117 career games at UMD. Current Whale teammate – and Swedish player – Michelle Löwenhielm was also a member of those Bulldog teams beginning with the 2014-15 season up through last season. In addition to her former college teammate in Löwenhielm and the Russian Sorokina, Mrázová also has standout Finnish goaltender Meeri Räisänen by her side as well. Despite the three losses for Connecticut, both Mrázová and Räisänen have been paramount in keeping their team competitive. Asked whether having a number of European teammates made her feel more comfortable, Mrázová did not really feel it was the case. The Connecticut Whale’s (from left to right) Michelle Löwenhielm (Sweden), Meeri Räisänen (Finland), and Kateřina Mrázová (Czech Republic) are the first players from their respective countries to play in the NWHL. (Photo provided courtesy of Kateřina Mrázová/Meeri Räisänen). The Whale are certainly excited to have Mrázová as well. Part of the reason why she has been one of their few bright spots on offense is because of her tremendous stickhandling. This was especially apparent during the Whale’s 7-0 loss on the road in Buffalo on Oct. 13. While the score may have depicted otherwise, more than once Mrázová appeared to have the puck on a string and dipsy-doodled through a Beauts defender. Her stickhandling is something she has worked on since she was a child. 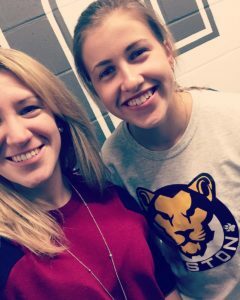 The Connecticut Whale’s Kateřina Mrázová (left) and the Boston Pride’s Denisa Křížová are the first two Czech players in NWHL history (Photo provided courtesy of Kateřina Mrázová). Though she may downplay what impact being European has on her NWHL career, Mrázová is incredibly proud to represent the Czech Republic in international play. She also recognizes that the exposure that she and Křížová are receiving in the NWHL is a good thing for Czech women’s hockey on the whole. Three times as a teenager Mrázová represented the Czech Republic at IIHF Women’s U18 World Championships. As she moved into her adult years, she has played for the Czech Women’s National Team in five IIHF Women’s Worlds tournaments. That accounts for 26 games total, in which Mrázová has scored nine goals and 12 assists for 21 points. Anytime that she dons the colors of her country, she knows that the experience betters her both as a person and as a hockey player. “The World Championships are very specific tournaments where you are under pressure,” Mrázová stated. “Every single game is very important and always matters at the end of a tournament. Also, playing for a National Team is always like a holiday for me and a great responsibility. Such games give you experience that no one can take it from you. The experience of international tournaments is very beneficial, and I wished all the players could play such games in their career sometimes. Mrázová and the Connecticut Whale have 13 regular season games remaining. Their next game is Nov. 18 on the road in New Jersey to face Metropolitan. With The Ice Garden’s report that all five NWHL teams will in fact participate in the 2018-19 postseason and vie for the Isobel Cup, losing their first three games seems inconsequential for the Whale, at least in the grand scheme of things. In Mrázová’s eyes, it is even more so. She has no hesitation in setting lofty expectations for herself. In fact, Mrázová is adamant that her team is capable of winning it all, and will strive to do so.